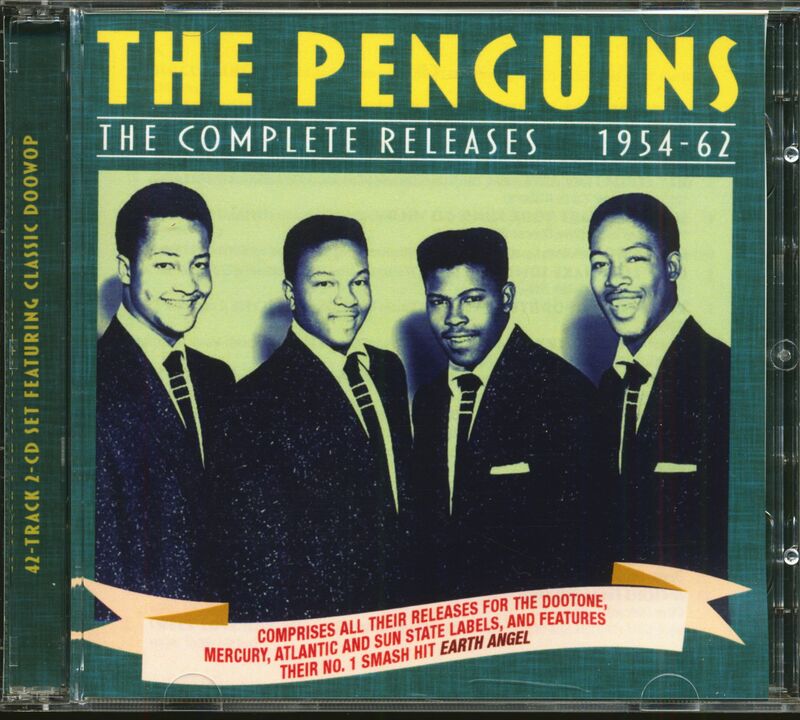 The Penguins were one of the several doo-wop groups of the 50s who took their name from a bird (others included The Orioles, The Ravens, The Flamingos and The Robins), and they are best known for their much-covered pop Top 10 and R&B No. 1 hit "Earth Angel", which later came to worldwide attention when it was used in the "Back To The Future" movie. Formed at high school in Los Angeles, the group developed a style that was as R&B and rock 'n' roll as it was pure doowop. "Earth Angel" was their second release for the small Dootone label, and it topped the R&B charts, crossing over to reach No. 8 in the pop charts, where it was overtaken by the Crew Cuts' cover version. 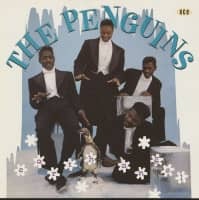 They moved to the Mercury label, and then to Atlantic, but could not repeat their chart success, despite releasing a string of top class R&B material under the aegis of their manager/producer Buck Ram, whom their shared with The Platters. After some line-up changes, the group eventually broke up in the early '60s. 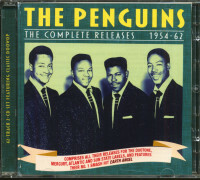 This 42-track collection comprises every track released under the Penguins name on singles, their LP and EPs during their career, so is a definitive overview of their career, and a fine example of their genre. 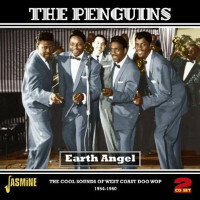 The Penguins' Earth Angel' was reputed to have sold two million copies on Dootone in 1954. The song was written by Jesse Belvin and recorded by Cleveland Duncan (lead vocal, born July 23, 1935), Curtis Williams (1935), Dexter Tisby (1936) and Bruce Tate (1935). Gently rock-inflected, the record distilled the feeling of adolescent uncertainty per-fectly. It remains America's favourite oldie. 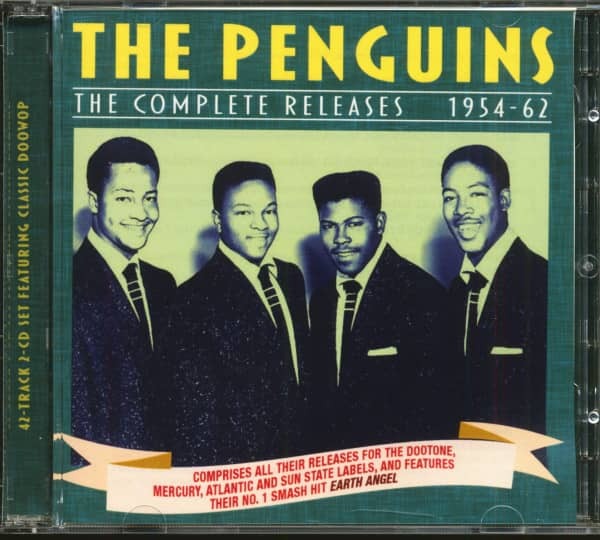 Subsequently managed by Buck Ram, the Penguins had no comparable success, but recorded a series of fine discs for Mercury, Wing, Atlantic, Dooto, Sunstate and Original Sound, where Frank Zappa wrote and produced 'Memories Of El Monte' for them in 1963. During this period, Teddy Harper and Randolph Jones replaced Williams and Tate. 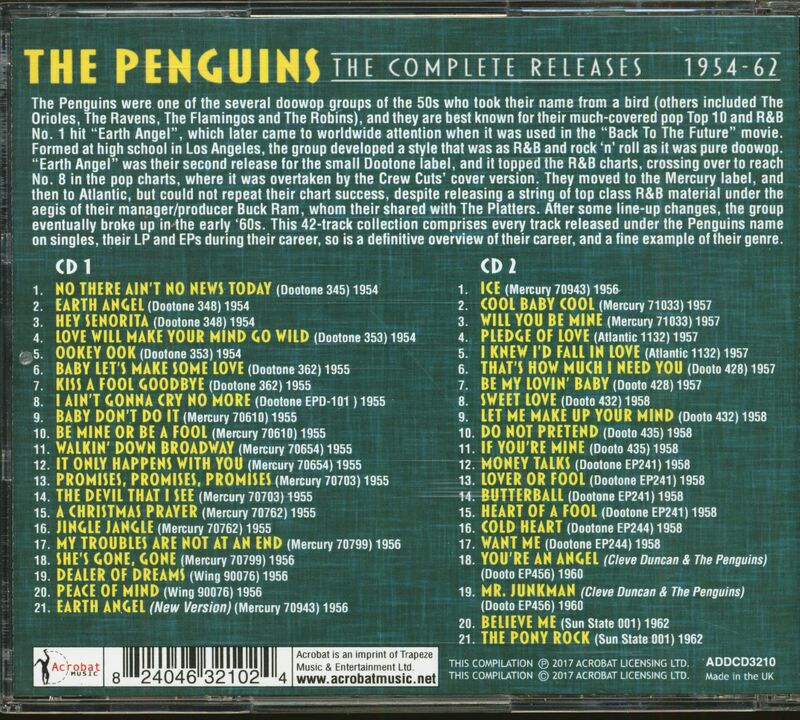 Customer evaluation for "The Complete Releases 1954-62 (2-CD)"